Second-guessing Academy Award nominations is one of the most cherished pastimes of movie lovers; sometimes, it's more fun than watching the Academy Awards themselves. We piss and moan about "snubs," and shake our fists at the generic pabulum filling so many categories. If the Oscars didn't exist as an example of how much better we think we understand cinematic greatness than those working in the industry, we'd have to invent them. But that second-guessing becomes even easier when categories present us with unknown quantities. Fans of Phil Lord and Christopher Miller's The LEGO Movie were instantly flabbergasted to note its omission from the nominees in the Animated Feature category, and even more so when they saw that one of the actual nominees was something called Song of the Sea. Song of the Sea? What the hell was that? As it turns out, perhaps we should have expected it. Song of the Sea director Tomm Moore previously made another "what the hell was that?" animated-feature nominee—2009's The Secret of Kells—which bumped another expected nominee by Lord and Miller (Cloudy With a Chance of Meatballs). So, in other words, maybe don't invite them to the same dinner party. Awkward. Clearly the Academy digs Moore's particular thing, since Song of the Sea—like The Secret of Kells—is a fantasy based in Celtic mythology, with a voice performance by Brendan Gleeson. It begins with a pregnant mother disappearing on the night she is about to give birth, leaving her young son, Ben (David Rawle), and husband (Gleeson) with the new baby girl, named Saoirse. Six years later, Saoirse still hasn't spoken a word, just one of many reasons Ben finds it difficult to deal with his sister. But the appearance of some mysterious lights might lead to answers about Saoirse's uniqueness, connected to the legend of the selkie (which, in Celtic mythology, is sort of a shape-shifting were-seal). Moore's visual style is certainly distinctive in the CGI-dominated contemporary animation landscape, with his resolutely one-dimensional planes, hard edges and geometric forms that make his images look like illuminations from a medieval manuscript. 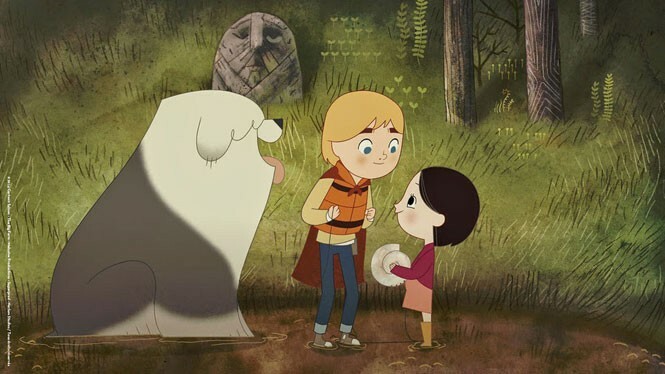 There's a potential for strong emotional content in Ben's conflicted relationship with Saoirse—whom he associates with the absence of his mother—and Moore sets up a solid premise by forcing the two children to travel unaccompanied on a quest together, where their mutual dependence will force them to confront the issues that divide them. Yet, there's something that holds Song of the Sea back from achieving the kind of impact that seems built into its narrative structure. Part of it is the vocal performances, which always feel somewhat muted and lacking in genuine power; Moore still hasn't figured out a way to convey the steely intensity of Gleeson's delivery to an animated character. But it's also in the characters' faces, which demonstrate a limited range of expressiveness that blunts the most potentially powerful scenes, like Ben and Saoirse's grandmother (Fionnula Flanagan) taking them away from their lighthouse home to live with her in the city. Nor do the characters intended to function as comic relief provide much that's actually funny, rather than subtly whimsical. There's a purely functional concern for character animation on display, rather than the kind of work that turns lines into real people. There's no question that Moore has a singular, imaginative visual sensibility. Song of the Sea is full of fancifully designed magical characters, like a wizard with a seemingly endless beard, a trio of musical faeries and the owl-witch Macha. His work looks like nothing else out there in the feature-animation world, and the stories he tells involve a delicacy that is also rare among multiplex features that can often seem loud and garish. But there's a difference between being different and being better. And, while it might seem unfair to stand Song of the Sea head to head against The LEGO Movie, that's ultimately what Academy voters had to do. Did they find more emotional honesty in the faces of Moore's characters than in Lord and Miller's plastic pieces? More insight in his story? More visual imagination in his stylized Irish landscape? Song of the Sea proves charming, and sweet, and perhaps too introverted—which isn't quite the same as everything being awesome.